King Midget was a micro car produced between 1946 and 1970 by the Midget Motors Corporation. Although the company started out by offering a kit to build the car, they soon added completely-assembled cars and later only offered completed cars. 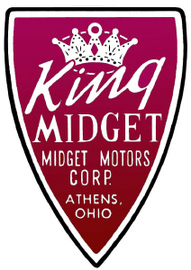 Company founders Claud Dry and Dale Orcutt first sold the King Midget as part of their Midget Motors Supply operations in Athens, Ohio. By 1948, they began to use the name Midget Motors Manufacturing Co., too. In about 1956, Dry and Orcutt changed the name of their company to Midget Motors Corporation.